The fresh fennel has a pretty intense anise flavor and are delightfully crisp. Cut of the top, often a bit woody stems and the lowermost base. If you are lucky enough to get the top of the fennel still on, cut it off and use it in soups, risotto or why not as beautiful decoration? It’s full of flavor! I love fresh fennel and those of you who follow me on Instagram, knows that I even tend to eat it for breakfast! Crunchy and good to start the day with. I combine it on a breakfast plate together with other vegetables such as a creamy avocado, cherry tomatoes, mild cucumber etc. Who said that you were bound to eat a sandwiches or porridge for breakfast each day? A classic combination is to combine the fresh fennel with sliced oranges and maybe some nuts for a quick fresh salad. The small tart pomegranate seeds also goes very well with the fresh fennel. Slice the fennel very thin on a mandolin or cut them as thin as you can for a salad. Just add a few drips of a good olive oil and salt on top and you’re there. 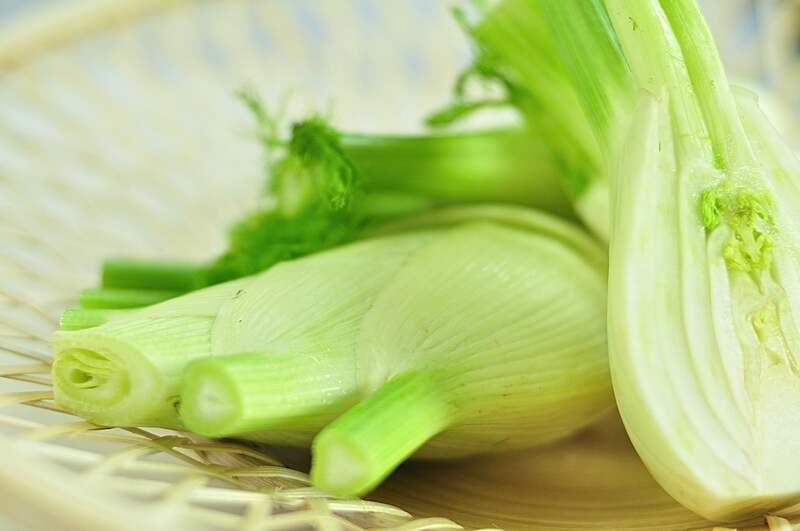 The intense anise flavor in the fennel oddly enough disappear when you boil it. Instead you have with a light green bulb with a soft taste that is wonderful in stews, soups, grilled or gratinated. Fennel is also quite lovely if you cut it into thick slices and caramelise it with sugar and orange juice. A truly excellent flavor combination! Make sure to purchase the most beautiful fennels when buying. They should be hard, solid and with hardly any brown spots. Once bought, use them as soon as possible although they probably can handle some day or two in the refrigerator. The small gray-green seeds of the fennel contains a lot of flavor! In Sweden, we use them more than enthusiastically in various breads such as soft flatbread or in sweet loafs. Several of the Mediterranean countries also use the spice frequently but then in different kinds of stews, soups and rice dishes. If you visit an Indian restaurant, you often get sugar-coated fennel seeds in different colors after finished dinner. It is believed since the medieval that the seeds are good for the digestion and it is actually quite fresh to chew on the seeds even though it may feel a little bit strange to do so. The stores often sell both ground and whole fennel seeds. The whole is always to prefer, even if it causes a bit more work. Grind them (or run them in an electric coffee grinder) and you soon feel the enormous difference in taste! It’s worth the minor workout, I promise you! Hope you are as excited for the fennel as I am. If not, give it a chance and discover a great vegetable to add to your repertoire. Soon, several recipes with fennel will be posted on the blog!